After almost two years here, we have different patterns and habits, routines we have adopted that have become second nature. 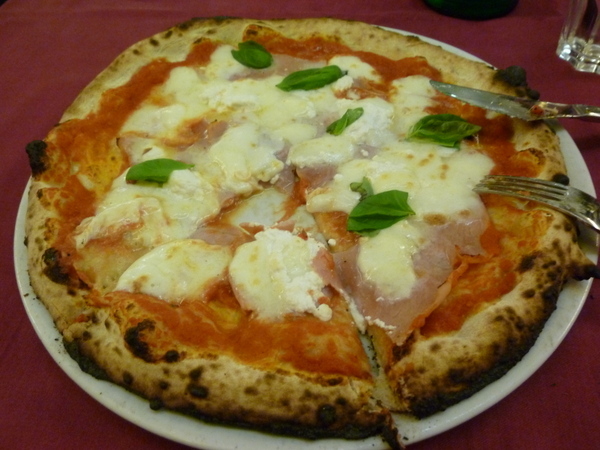 I had pause to think about some of them recently and thought I would share with you some things we do in Italy that we did not/could not/would not do in the U.S. Very fresh Mozzarella di Bufala is key! Give our building super/doorman/manager a tip for Easter, Christmas and Ferragosto. Oh that’s right; we didn’t have a portiere in Portland! Decide to walk instead of waiting for the bus because the transit tracker app says the bus is still 25 minutes away and it only takes 20 minutes to walk home. Shrug my shoulders when the bus that was 25 minutes away passes me 5 minutes later. Whaddya gonna do? 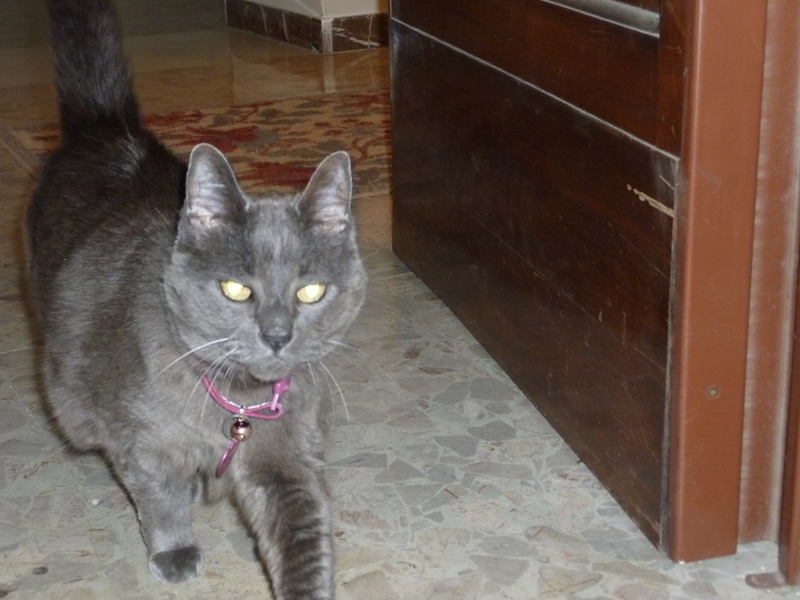 Janie trots out the door under a watchful eye…. Worry when the crazy unfortunate man next door stops yelling…then find myself relieved when he starts yelling again because it means he’s OK.
Get our groceries delivered: Best thing ever. (Remember Homegrocer.com? Way ahead of its time!) Here it’s a guy with a tiny truck or un motorino delivering the stuff we bought at the store an hour ago. Essential when you drink wine buy heavy bottles of beverages and do not have a car. 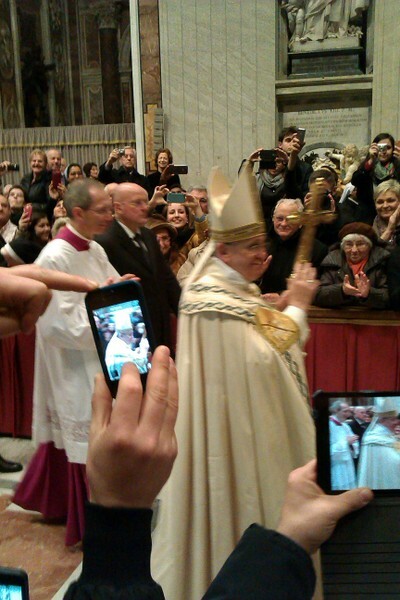 Go to mass and see the Pope! Thanks so much for this post. I loved it! Except it made me quite envious! Really fun … thanks! Laurel, You have a really fun writing style. Hang on to these posts – I think you have a book in your future! Different topic … do Italians “celebrate” April Fool’s Day? Thank you for your kind words, Will. If you know any publishers, drop a hint, OK? April Fools’ Day is “Pesce d’Aprile” in Italy For a great example, see today’s “Italian Notebook” entry http://www.italiannotebook.com/local-interest/colosseum-condos/. Fun! I wonder how many people took the bait. Ciao Rachel! You should. No doubt the kids need to learn it too. Is Leila still learning Mandarin and French? Miss you guys! Thank you Loretta! I try to see the humor where I can. Ciao bella!!! Grazie mille for such a fab list. Makes me think too. Good pic of Papa Francesco!! Carol just said how much she enjoys hearing/reading your blog. I miss the stories of the cats. I’m glad to see them back if only to speak about elevator lobby. And I feel your bus passing pain. Caro Nigel, How nice to hear from you! I wish the cats offered more fodder for my blog. They are quite old and lazy! Janie escaped again last fall and spent the night in a neighbor’s garage. thank God for a caring neighbor! When are we going to see you two again?